Ripley and the Xenomorph face off in “Versus,” a two-man show at Gallery 1988 in LA. So much great art centers on conflict. Love and pain. Heroes and villains. Good and evil. Black and white. 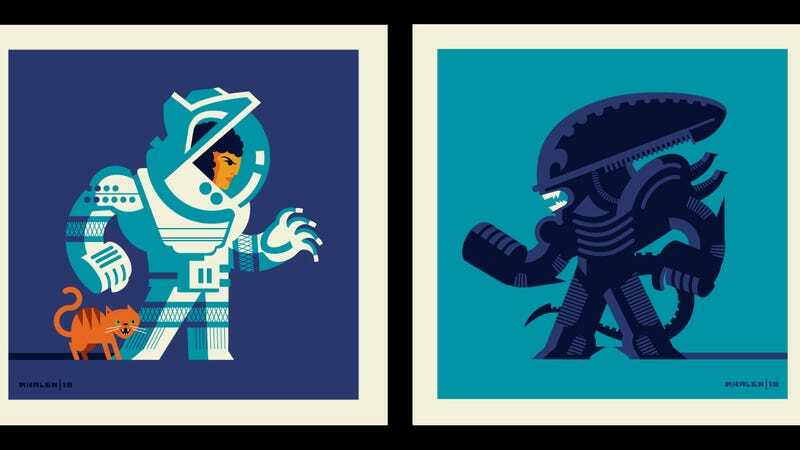 And, in one special case, Tom Whalen and Dave Perillo. Whalen and Perillo are pop culture artists from Pennsylvania whose latest show, called “Versus,” opens this Friday at Gallery 1988 in Los Angeles, CA. The show contains almost 100 pieces of art, all 4x4 inches and sold in sets of two. Each set, of course, depicts characters who are “versus” each other. There are 47 sets in the show, 28 by Perillo and 19 by Whalen. Here are four of each, a few of which are exclusive reveals. To promote the show, Whalen and Perillo have been creating negative campaign ads for one another on social media, like the ones here and here. They’re really funny and provide a good look at the personality each artist puts into their work. What’s more, these colorful pieces are the perfect size for you to hang a bunch of them up on your wall. Each set of prints comes in an edition of 40 and will first be on sale starting at 7:00 pm on June 8 at Gallery 1988 in Los Angeles, CA. All extras will go online the next day at this link.